FWF: Control cables. All installed. Nothing worthy of elaboration here. Just needed to take time to ensure all cables have full travel with the requisite 1/16" cushioning, per plans. All control cables are installed. All knobs below the panel. Autopilot: Roll servo wired and safety wired. My roll servo was installed back in November 2013 and December 2013. However, only now was its wires finally routed and its bolts safety wired (the latter by my friend). What isn't obvious in the picture is that the ground wire is attached via an eyelet contained in the bolt holding the Adel clamp. The square cutout in W-823-1 Aileron Bellcrank Bracket is for a Molex connector leading to the roll servo. I just caulked in edge grommets on it then fixed and routed the wires through there. The safety wire could be better. My friend worked at it for two hours. It's not easy to do. I may revisit it later. Fuselage: Upper forward fuselage. Top skin riveted on. 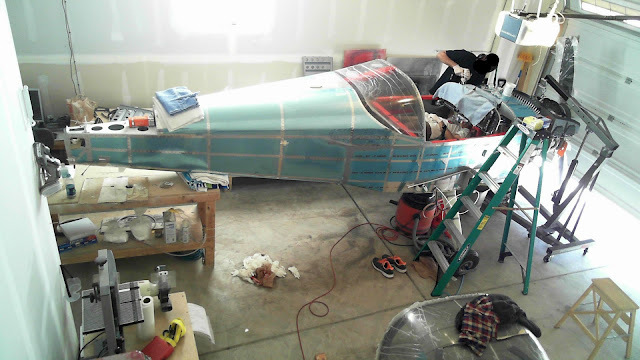 Back in November 2015, when I mostly completed the upper forward fuselage section, I opted to not rivet on the F-01471 Forward Top Skin so that I had complete access to the area behind the subpanel during my wiring endeavors. Now that wiring is complete, it was time to put on the Forward Top Skin. There are three complicating factors. 1) The C-01440-L/R Canopy Hinge Bracket bolts make access for riveting difficult. No joke: We used chopsticks to keep the bucking bar aligned. 2) The skin needs to be entirely sealed with sealant. Finally 3) it ain't fun being the guy with the bucking bar. When cleco'ing the Forward Top Skin in place, I found that I could not get the holes into the longeron to line up properly. Which is odd, because back in November of 2015, the F-01488-L/R Upper Engine Mount Brackets were match drilled into the skin whence the skin was cleco'd originally from the center to the sides. However, I found that if I cleco'd the sides of Forward Top Skin first, I could get excellent alignment. My poor friend drew the straw for holding the bucking bar. Here we are, riveting away. Sealant is applied to all flanges prior to cleco'ing the Forward Top Skin on. On the Upper Engine Mount Brackets, the bolt holding the FF-01400 Dyna-1 Tri-Gear Engine Mount prevented good access to bucking the forward-upper-most rivet. I didn't want to risk messing up this important area of the airframe. So I checked with Van's if a CherryMax CR-3212-4-5 could be used rather than the AN426AD4-7 (which is what is done for the analogous rivet on the F-01489-L/R Lower Engine Mount Bracket). They approved of the substitution. Here are the Upper Engine Mount Bracket rivets from the outside, on the right side. Here are the bucked rivets on the left and right mounts. They are acceptable. A few pictures showing the sealant results. It got messy in there, but no worries: No one will see it. Then the flanges for the SkyBolt quarter turn fasteners were riveted in. These were fitted back in December of 2016. Next step is finishing up the sealant application. It's important to fill with sealant all of the relief notches on the forward and aft edges. When this cured, I painted it the interior color. Then I applied another layer of sealant because I didn't like how the first one came out. I am please with how this finally came out. What you're seeing below are the lower edges of the Forward Top Skin where it meets the F-01455 Sub Panel. Here are shots showing the relief notches filled with sealant. The rivet in the left picture was later replaced (in fact, it was this very picture that showed that the rivet was unacceptable). All done (my friend is reworking the top cowl left side). 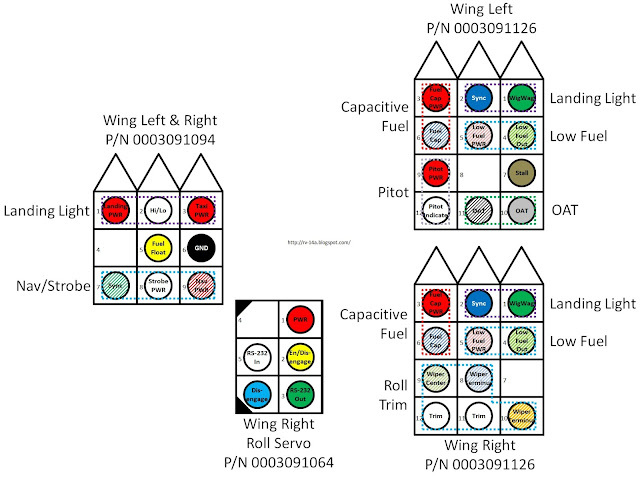 Because I chose to do all the wiring myself (to save money and to support my unique avionics setup as shown on my panel), I was responsible for determining my routing scheme. As this post outlines, from 15-Aug-16, the wiring in my wings include support for a number of functions. Here is my wiring map for the wings. I needed a lot more wires than what the stock setup accommodates. My optical low fuel level sensors and capacitive fuel senders needed to have their wires come from the front of the spar to the back. My landing lights require a lot of wires, as compared what the Van's suggested lights uses. Though I don't plan to install it, I wanted accommodations for electric roll trim should I decide to install it in the future. The right wing autopilot roll servo needed an additional Molex connector added to the right wing's W-1029A-R Torque Tube Support Bracket because there wasn't enough space on the included W-1029D-R spacer. Here is a picture showing the additional spacer I added to the right Torque Tube Support Bracket showing the Molex connector placed (upside down! ), prior to final wiring. I fabricated the spacer with some scrap and riveted it in to the Support Bracket with two rivets. As noted above, the optical low fuel level sensors and capacitive fuel senders needed to have their wires come from the front of the spar to the back. They cannot be routed through the spar as-is. I could have drilled a hole in the webbing and passed them through a grommet from there, but I didn't want to mess with the structural integrity on a part as important as the spar. So I routed the wires in the space between the T-00001-L/R Fuel Tank Skin and the spar web, as shown below. I first injected sealant in the space, tucked the wires in, then locked them in place with a fillet of more sealant. This approach will prevent the wires from moving and chaffing in that spot. The left image shows the wires passing under the spar on the left wing. The left image shows the wires from the optical low fuel level sensor and from the capacitive fuel sender just tacked to the tank rib with sealant on the right wing. The final wiring setup on the right wing (top image) and left wing (bottom image). Back, in January 2016, I cataloged the antennas I bought for the airframe. Among those was a Comant CI-158C-2 VOR/LOC/GS antenna for the GTN 650. I had planned to mount this "cat whiskers" antenna on top of the vertical stabilizer, or even under the tail cone. However, it turns out that fitting it on the vertical stab was very challenging. And it couldn't fit under the tail cone as the latter has a j-stiffener running down the center. So I needed to consider other options. I'm not a fan of wing tip antennas as they are far from ideal. However, in this case, it appeared to be the best option. So I went with an Archer VOR antenna. This is an easy antenna to construct on one's own and that was my original intention. However, when I added up what I needed to buy to make that happen, I decided that the opportunity cost of just purchasing the antenna was worth it. Here is the product page from Archer. Here is the antenna. I will be placing mine on the right side as the left wing can't accommodate an additional run of coax as easily as the right. Five nutplates on the wingtip needed to be drilled out. The antenna is placed. I put it far forward. Nutplate holes are match drilled into the antenna. There are two clips on the forward element of the antenna that help route the nav/strobe light wires in the proper location. The screws associated with those clips also serve to affix the antenna to the wingtip. I toyed with the idea of not drilling the holes for those screws and instead use wire tires through the clips. However, I discard that idea in favor of using the screws. To drill the holes, I needed to use my right angle adapter. I used the unibit only because it could be chucked into the adapter. Getting ready for riveting the nutplates. Be sure to use soft rivets or, if those aren't available, don't fully set the hard rivets. Here is the antenna finally placed. The forward clips aren't yet in as the wingtip is not yet installed. You can see that I also tacked the antenna down with some clumps of epoxy-flox. They can be easily flicked off if the antenna needed to be removed at some point in the future. The holes for the clips on the bottom of the wingtip are shown. When I drilled those holes, chucnks of gelcoat broke off. So I needed to fill them and sand them down before countersinking for the holes. Speaking of which, I used #6 screws for those clips.